Sheikh Nahyan bin Mubarak (c) with T10 chairman Shaji ul Mulk (second right). 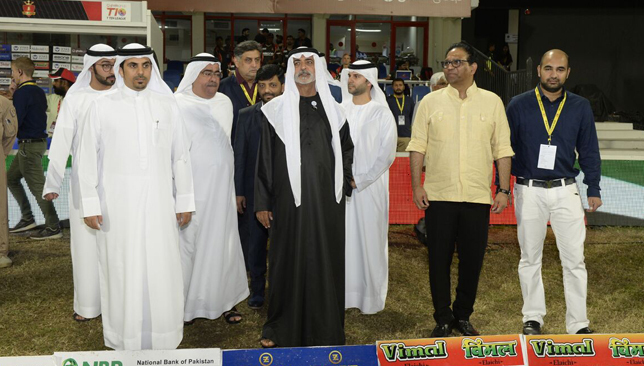 His Highness Sheikh Nahyan bin Mubarak Al Nahyan, UAE Minister of Tolerance and Chairman of the Emirates Cricket Board, lauded the rise in popularity of the T10 League after enjoying the action at the Sharjah Cricket Stadium. Sheikh Nahyan toured the Sharjah ground, accompanied by Shaji Ul Mulk – chairman of the T10 League – and praised the growth shown by the newest format. “The UAE is a country of peace, harmony and tolerance, where nationals of more than 200 countries live happily and in harmony. It is due to the peaceful and harmonious environment, we see innovative steps are undertaken and the T10 League is an important innovative step that will popularise the game of cricket and this is emerging from the UAE and will spread to the world,” Sheikh Nahyan said. “Earlier, the batsmen used to dominate the T10 League. But now I see the bowlers are also coming back strongly to dominate the match as it becomes interesting,” he said. Sheikh Nahyan expressed his happiness in seeing world-class cricketers fighting it out in the UAE. Organisers also announced plans for the next year, stating they have made sure the schedule next year does not clash with international fixtures, as it has done this time with Pakistan playing New Zealand in the UAE. The third season will be held from October 16-25, 2019. “The new dates have been announced to ensure that they do not clash with any major international tournaments and that will help us to attract the best cricketing names and talents so that they could play and enrich the ten-over format cricket and help it to expand worldwide. A timely century from opener Murali Vijay. 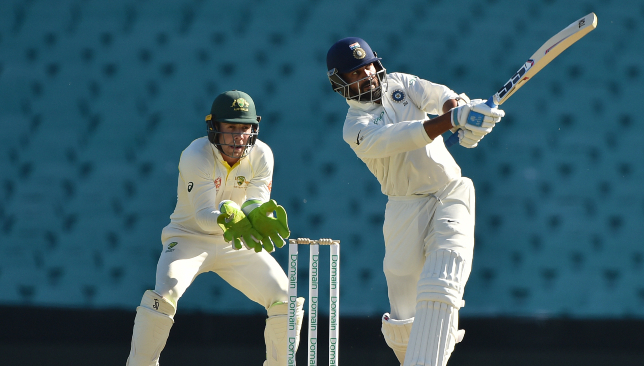 Veteran opening batsman Murali Vijay is raring to go in the opening Test against Australia at Adelaide after striking a quick-fire ton in India’s drawn tour game against a Cricket Australia XI at Sydney. Vijay slammed a 132-ball 129 in India’s second innings on Saturday with the help of 16 boundaries and five sixes. The tourists posted 211-2 in their second innings before stumps were drawn at the Sydney Cricket Ground with KL Rahul chipping in with a 62. With youngster Prithvi Shaw ruled out of the Adelaide Test after sustaining an ankle injury in the warm-up clash on Friday, Vijay seems certain to open the innings for India alongside Rahul. The 34-year-old is more than ready to take guard for India at the Adelaide Oval, a venue where he struck a 99 and 53 four years ago in his side’s 48-run loss to Australia. “Basically, I am ready, I just want to go out there and contribute and give a good start for my team,” Vijay was quoted as saying by cricket.com.au following his ton against Cricket Australia XI. “I have always been aiming at that and nothing different this time. It’s an interesting series for us and hopefully we can start it well. The right-hander has just returned to the Test setup after being unceremoniously dropped from the squad after bagging a pair in the Lord’s Test against England. Having missed out on selection for the home series against West Indies, Vijay is eager to make the most of his second life. “You have to work and find ways to work things out. If you are not part of the team, you have to make sure you keep your work ethics at the top level and once you get the chance you have to be ready to go,” explained Vijay. The first of the four scheduled Tests between Australia and India will get underway at the Adelaide Oval on December 6. 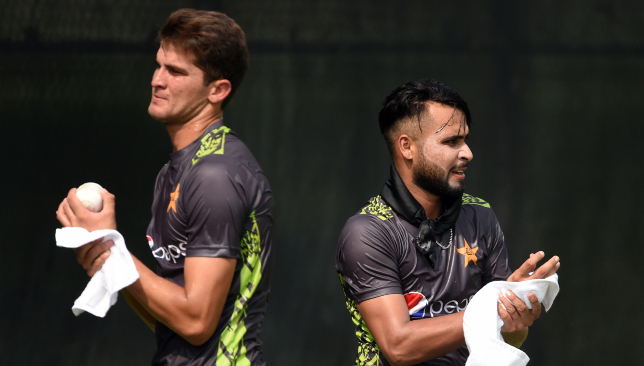 Shaheen Afridi (l) will make his Test debut for Pakistan. The three-match series between Pakistan and New Zealand is perfectly poised at 1-1 as the two teams head to Abu Dhabi for the deciding Test which gets underway on Monday. The Kiwis claimed a dramatic four-run win in the series opener at Abu Dhabi before Sarfraz Ahmed‘s men stormed back with victory by an innings and 16 runs in Dubai. With all to play for both teams at the Sheikh Zayed Stadium, we look at the key talking points heading into the decider. 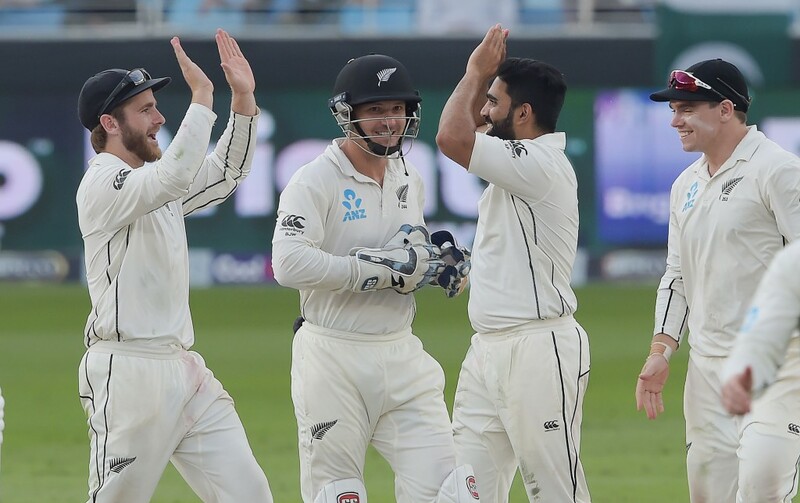 Kane Williamson has a shot at emulating Graham Dowling and his men who were the last New Zealand outfit to notch up an away Test series win over Pakistan. That win had come all the way back in 1969. As such, the Kiwis are well placed to repeat that historic win as they head to Abu Dhabi. New Zealand’s last away Test series win on Asian soil came in 2008 against Bangladesh but a victory over Pakistan in the UAE would be a much bigger achievement to savour for the tourists. They ran Pakistan extremely close in their last Test series in the UAE which ended in a 1-1 draw and have a real shot at going one better this time around. A rare chance for Williamson and his men. Pakistan have been rocked heading into the decider with star seamer Mohammad Abbas all but ruled out of the clash due to a shoulder injury. The 28-year-old has been a revelation with the red-ball since making his international bow last year and came into the series against the Kiwis on the back of picking up a staggering 59 wickets in just 10 Tests. Abbas was a monster in Pakistan’s 1-0 series win over Australia recently and his absence will be felt by Sarfraz’s team. The seamer could undergo a late fitness test on Monday morning but his hopes of taking the field at Abu Dhabi appear bleak. 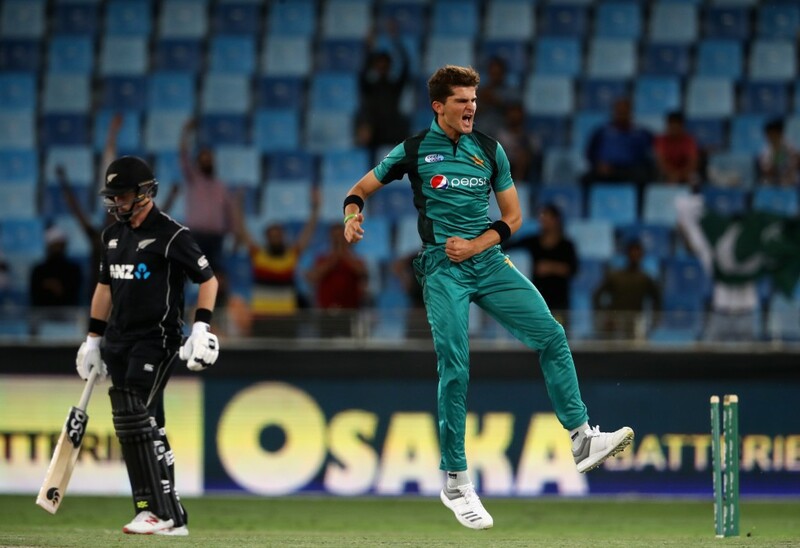 With Abbas injured, Pakistan could hand a Test debut to teenage pacer Shaheen Afridi who has been going from strength to strength in the limited-overs formats. The 18-year-old bagged the man-of-the-series award in the preceding ODI series between the two sides and will be raring to make an instant impact at the Test level should he get the nod on Monday. He is in excellent nick in red-ball cricket too having picked up a seven-wicket haul in Pakistan A’s recent first-class clash with the English Lions in Abu Dhabi. Afridi was exceptional in the preceding ODI series. As the two sides ponder their team combinations for the Abu Dhabi decider, two players will definitely be under the scanner following their poor shows in the first two Tests. For New Zealand, the role of Colin de Grandhomme in the side will need examination following the all-rounder’s dismal showings with the bat so far in the series. The 32-year-old has been fairly tidy with the ball with four wickets in the two Tests but has been poor with the bat. In four innings so far, Grandhomme has mustered only 17 runs with two ducks to his name. The right-hander’s non-show with the bat really affects the balance of the New Zealand line up and it will be interesting to see if Williamson opts to persist with him for the third game in a row. On the other hand, Pakistan off-spinner Bilal Asif has largely been under-bowled by Sarfraz in the series with just two wickets to show for from his four innings. The 33-year-old has paled in comparison to leg-spinner Yasir Shah who picked up a record 14-wicket haul in the Dubai Test alone. 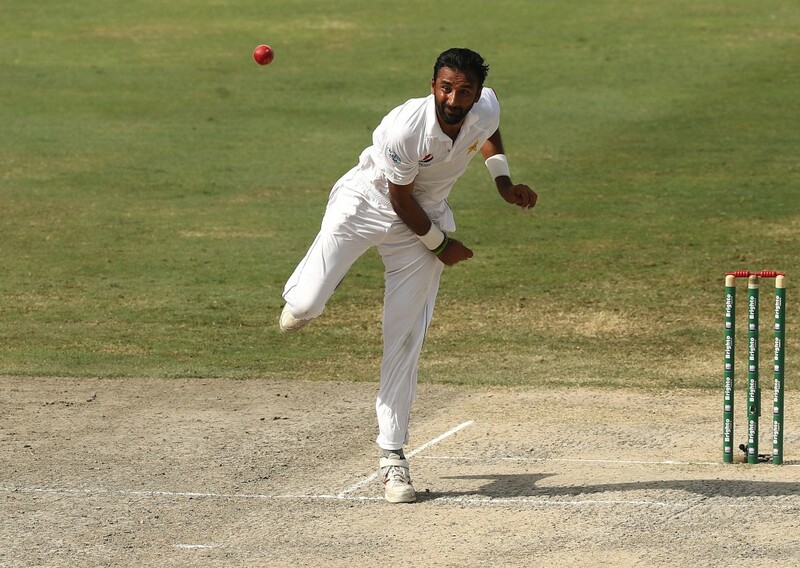 Asif will almost certainly be given another outing in Abu Dhabi given Pakistan’s lack of specialist spin options but he will need to really step up with his performances if wants to maintain his place in the Test side in the long run. Bilal Asif needs a big performance in the deciding Test.